“I’ve enjoyed bicycling since I was a kid, back in the Czech Republic. It provided the freedom to move around without depending on either public transit or my parents. When I moved to Salt Lake in 1998 for my postdoc it felt natural to continue riding. I save on a parking pass and car costs and it forces me to get up on my bike every morning and ride to work. Our older daughter is 5, and she goes to the Child and Family Development Center here on Presidents Circle. We have been commuting together for about 3 years. 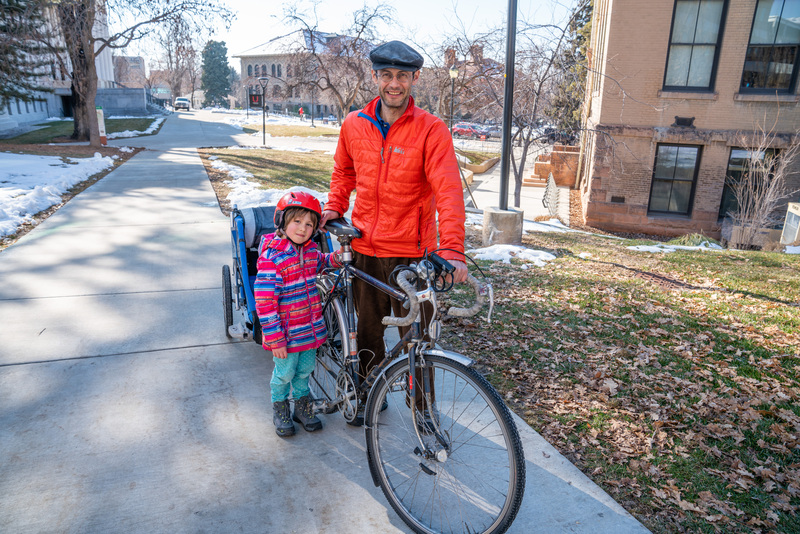 We ride my old road bike and a used $200 Chariot trailer. When it is warmer, we switch to the Weehoo. It takes us about 25 minutes to get up here, about three miles. Weather doesn’t impact our commute much. It’s all in the equipment. In the winter, I dress our daughter in snow pants and a warm jacket. I wear what you see in the picture with an extra sweater for the downhill ride home. I consider myself a fearless bicyclist but riding with a kid, I’m much more aware of my surroundings. I am very sensitive to people giving us space, so please don’t pass us too close on 1500 East or Guardsman Road or block the bike lane or crosswalk.